For more information, please read or download our practice policy below and call our office to book your next rental. Practice sessions may be scheduled beginning on the Monday prior to the week of requested time slots. The West Cal Arena’s office hours are Monday - Friday, 8:00am – 4:30pm and will begin taking calls for practice at that time. To schedule your practice time, please call the main office at 337-528-9378. Practice times are typically available Monday - Friday 3:00 - 10:00 PM, and on select weekends where no events are scheduled. Limited time may also be available Monday – Friday prior to 3pm. Please check with the administration office for availability. The use of the West Cal Arena for practice is subject to management’s ability to properly prepare the facility for its scheduled events. Management is not obligated to provide the use of the facility for individual practice should it interfere with these events or other necessary maintenance and repair of the facility. Renters further acknowledge that the grounds will be prepared so as to provide a safe environment and may not be “Performance” ready at the time of their scheduled practice. All practice time reservations MUST be paid for at the time of booking. The West Cal Arena reserves the right to cancel and/or reschedule any practice times that interfere with the operation of the facility. Should the facility require to cancel and/or reschedule a scheduled practice time full refunds will be made available in the form in which payment was submitted. More than 20 participants are subject to regular rental rates. A “Participant” is defined as any individual actively taking part in any activity within the facility and does not pertain to spectators and/or visitors. For security and insurance reasons, at no time will anyone be allowed in the main arena or practice pen without lights. Violators will be asked to vacate the arena until such time as their scheduled practice time has begun. Cancellations must be made no less than 48 hours in advance of the scheduled practice time. Refunds – all refunds will be made in the form of arena credit. Credit time may be used for practice time only and is good for 30 days from the scheduled practice time. Any credit not used within this 30 day period will be lost. At no time will cash, credit card or check refunds be made available. Practice times not cancelled within the 48-hour cancellation period will not be eligible for any credit. Practice times longer than 2 hours and all rough stock practice must be approved by Arena Mgmt. Roping practice may be limited to certain days of the week depending on the events schedule. Please contact the arena staff to find out availability. Barrels and poles are provided at no additional charge. Please be courteous to others and replace barrels and poles when not in use. Any damage, broken or missing equipment will be the sole responsibility of the individual renting the facility for that particular time period. No one is allowed in the main arena until their scheduled practice time. 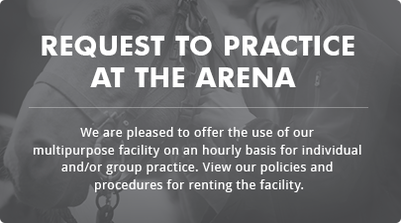 Please respect the time allotted for other renters in the arena and do not enter prior to your scheduled practice time or remain in the arena longer than your scheduled time as well. If special accommodations are needed, please contact arena mgmt to discuss additional rates that may apply. Please utilize all trash cans and police the arena and parking lot prior to leaving the property. Arena mgmt. reserves the right to refuse rentals to individuals violating the aforementioned policies and procedures and/or for just cause. Any matter not herein expressly provided for, shall rest solely within the discretion of the West Calcasieu Arena, the West Calcasieu Parish Community Center Authority and/or its Director.